Meet your new marathon motivation, Steve Bender. By Adjua Fisher·	 11/16/2016, 11:20 a.m. Remember Steve Bender? He’s the volunteer firefighter who ran last year’s Philadelphia Marathon in 50 pounds of fireman’s gear. Yes: he ran 26.2 miles in head-to-ankle (no boots — that’s taking things too far, he says) fireman’s gear. And this weekend, he’s doing it all over again … AND he’s running the Philadelphia Half Marathon decked out in his firefighter get-up the day before, too. (The race has dubbed running both events the “Rocky Challenge.”) We have a sneaking suspicion he may be a tiny bit crazy — or just really, really motivated. 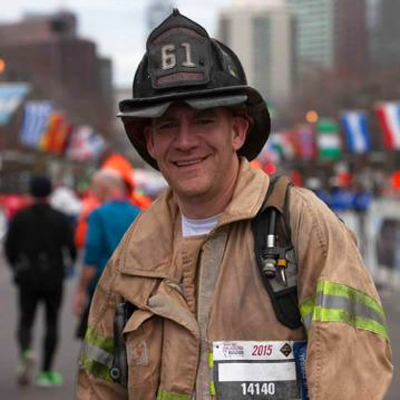 After chatting with Bender, a 42-year-old volunteer firefighter, about why he — along with four other folks who will be running the this year’s half marathon alongside him in fireman’s gear — is putting himself through the struggle again, we’ve come to the conclusion that it’s the latter: Bender is incredibly motivated. His goal in running both races in a get-up that causes people to stop, stare, clap and wonder “What the heck is he doing that for? !” is to get the word out about the Firefighter 5 Foundation, a Delaware-based non-profit Bender founded in 2013 that helps first responders all across the country maintain healthy physical and mental lifestyles. The foundation relies solely on donations, so getting people to stop and stare, and then ask, “But WHY? !” is essentially Bender’s way of fundraising. That’s dedication, right? When I asked Bender how he’s feeling about this race weekend’s forecast (it’s looking like pretty warm temps, in the 60s on Saturday, and rain on Sunday — neither of which are great conditions for running in heavy gear), he says, yes, it might be a bit miserable, considering the gear gets about 20 pounds heavier when soaking wet. But a little discomfort won’t stop him. “As long as there’s beer at the end, I’m fine,” he says. The thing is, there actually isn’t beer at the Philadelphia Marathon finish line, so we say a spectator or two ought to be waiting at at the finish for Bender, beer in hand, ya hear? The gear weighs him down, so you’ll find him toward the back of the pack, providing an extra dose of motivation for his fellow finishers. And speaking of motivation, Bender, who runs four to five marathons a year (a good chunk of them in his gear), says the best motivation he can give a fellow marathoner is, “Keep your head down and keep going. Every step is worth it.” And, as he says, soon enough you won’t remember how uncomfortable you were — you’ll just remember that you finished. And if anyone can say that without receiving an eye roll in response, it’s him. If you weren’t already impressed enough, know that Bender will also be running the Rehobeth Beach Marathon and Maine’s Millinocket Marathon in full gear come December. Now, excuse us while we go re-evaluate our level of grit — and make sure to be on the lookout for him this weekend!